VFX supervisor Allan McKay has posted a new free eight-hour video tutorial on creating destruction effects using 3ds Max and particle and volumetric simulation plugins thinkingParticles and FumeFX. The three-part series of videos covers the process of creating an FX shot – a watchtower being blown up – from start to finish, including dynamics and fracturing, shading and rendering. Along the way, McKay aims to cover more advanced topics like the process of art directing the simulations, and avoiding a standard out-of-the-box Voronoi fracture look to the finished effect. As well as the videos themselves, you can download free accompanying scene files, production scripts and shader presets. 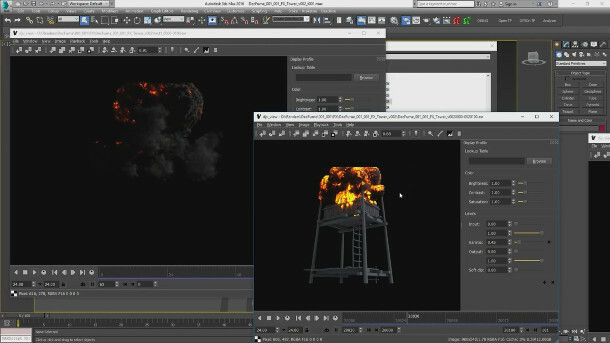 The training uses 3ds Max 2016, thinkingParticles 6 and FumeFX 4, including the latter’s new black body shader, but the scene file and most of the techniques should be compatible with older versions of the tools. If you’re interested, be sure to grab the files quickly: the videos and supporting material will only be available on McKay’s website until 18 January 2016.